Birding in Florida is unique in that so much of that state’s plenty is evident even to the casual observer. There are few places in the United States where simply driving around can leave you with a list of 30+ species, many of them large and spectacular. I’ve spent the last week in southwest Florida. It’s a family vacation, sure, but there’s always time for birding and in Florida, the birding often finds you. There are a few places where that is especially obvious, and one of those is the town of Cape Coral, just north of Naples along the Gulf of Mexico. 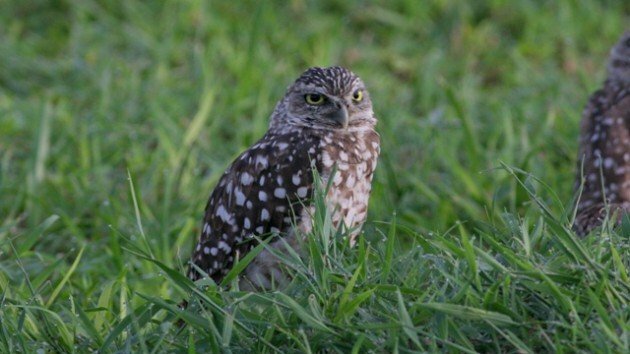 Cape Coral has a remarkable population of Burrowing Owls, cute little stilt-legged beasts we usually associate with the western part of the continent. But this Florida population is unique, not just by virtue of their plumage – they have striped crowns while their western brethren have spots – but by virtue of their ability to coexist with humans. 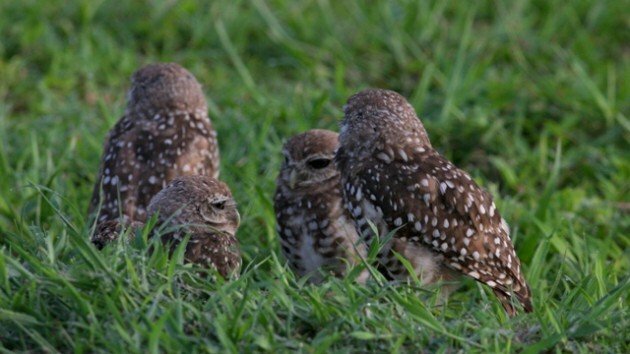 These owls don’t live in a state park or any sort of protected area, they live in the neighborhoods, right next door to stucco middle-class Florida homes, going about their business in a landscape of manicured lawns and screened-in porches. You can tell which abandoned lots host owls by a small roped off area with the tell-tale t-bars that the owls perch upon. But on the morning when my dad and I found them, they were clustered around the entrance to their burrows at the Pelican Boulevard Baseball Fields, a well-known spot for the birds. There were three burrows, each with a tenant. One had a cluster of recently fledged birds and their nonplussed parent. I don’t like to anthropomorphize, but this one looked ready for these birds to leave the burrow. But daytime owls always look miffed about something. The younger birds were harder to get the attention of. They seemed content to cluster together starting at each other, or the flock of starlings and Monk Parakeets whirling around. We used the car as a blind, and even that they were aware of. Every time we made a noise they’d quickly snap to attention, wrenching little owl heads around 180 degrees to find the disturbance. Passing cars elicited no such response. They’ve long since become habituated to that, being a normal part of their unusual habitat. The owls were by far the most interesting part of the park. Though we’d hoped to come across the reported Nanday Parakeets in the area, the best we could manage was a small flock of Monk Parakeets that would occasionally pass by, screeching loudly. I have to wonder where these birds go once they fledge. The habitat is pretty contained, and with the pressure to develop the non-owl-hosting lots, I’m sure nesting burrows are at a premium around here. I first saw them in 1994, and in the intervening 20+ years things seem mostly the same for them. Not worse, but certainly not better. Perhaps a commenter can shed some more light on where the young birds go. While there’s not much in the way of secondary birding opportunities in these Cape Coral neighborhoods, the owls here are easy to find. You probably won’t get a better opportunity to enjoy these little creatures. Even a non-birder cannot resist the appeal of cute owls easily seen. Nate, I was just 5 mins from the baseball fields in July. We had rented a house and just down the road was a small colony of BUOWs. (3 adults, 4 young) I had the opposite situation- the adults were super skittish but the babies were extremely tame. On my belly, I got within 5 feet of one who actually fell asleep for a few minutes. 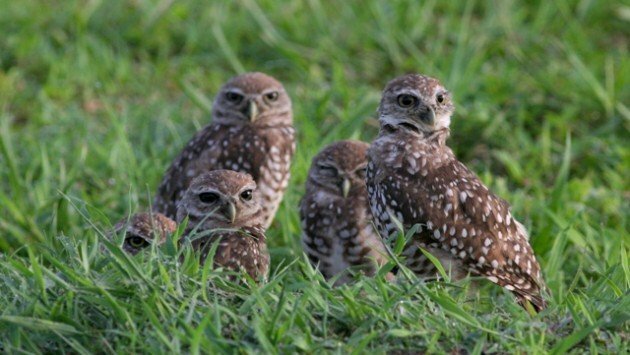 Is there a best time to see burrowing owls at Cape Coral?